Since having baby boy, I've been a lot more open with the realities of motherhood I share on the blog. I've shared the days where all you manage to do is take the dog for a walk, how you can try fake the look of a good night's sleep and I've mentioned in the past how I've cut down on blogging after baby. A lot of people have asked how I manage blogging. Nap time is my blogging time and scheduling posts in advance is the only way I'm able to keep blogging with two little boys. Blogging is "me time" and important to me, but not always easy to get time for. I'm not the only blogging mum who wonders how to juggle it all with kids, but there are plenty of mums out there who blog (like Shea, Jess, Kikki, Beth and Cecylia). I thought I'd share the tips and toys that help me amuse the boys and make the most of awake time together to free up nap times for blogging. There are many developmental benefits to baby gyms, but they also come in extremely helpful when you need a few minutes. While it's fun to sit and talk with baby about all the toys he's playing with and I enjoy seeing how similar he is to his brother with the toys he prefers to grab, it's nice for him to get some alone time to explore on his own. I like to sweep up, tidy up or even put the laundry out while baby plays in his gym so I don't have to do that while he naps. Having a toddler can be a help with housework! Toddler T has a little baby broom so he can 'help' as I sweep up, and pulling the wet clothes out of the washing machine and into the washing basket is the best game. It means I get things done and we get to play together. Letting baby watch as you fold laundry and feel all the different textures of the clothes means it takes a little longer, but it's also another fun way to connect. Trying to convince toddler T to help tidy his toys away before dinner isn't always successful, but is nice when it works! Tummy time is really important for babies. While I like to sit and read books to baby during tummy time, I've also been able to put baby down for tummy time while I chop veggies or cook dinner and his big brother is often happy to lay next to him and chat away. Baby is more likely to tolerate being left to play on his tummy alone if I've surrounded him with some soft toys to reach for first. Bath time is much more fun when there are special toys to play with. 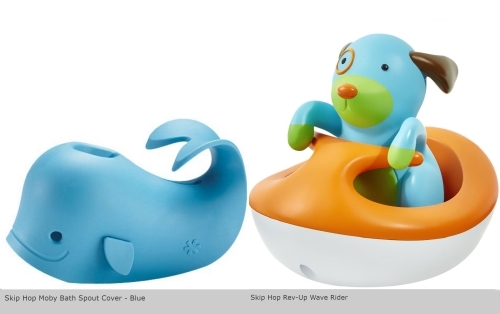 It's easy to go overboard with bath toys, there are so many cute ones! 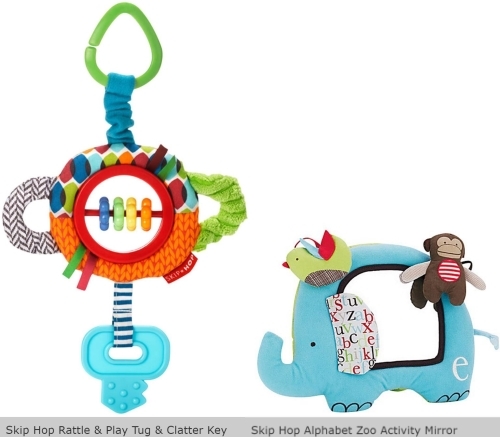 Picking out his favourite toys to throw in with his brother helps keep toddler T occupied as baby gets bathed, and it's nice to turn a routine nightly task into something a little more fun with toys. There are some pieces of housework (like ironing) I won't do unless the boys are asleep and out of the way, and some days where their nap times just don't line up. This is where living near grandparents comes in handy - they are happy to watch the boys now and then to allow me to get things done, and sometimes they'll even do a little bit of housework while babysitting! With all of the tips and toys above, I make the most of the time I get while the boys are awake and I can dedicate blogging time to when they sleep, so they don't see me on a computer constantly! Are you a blogging mum? How do you handle the balance between blogging and kids? Do you have a go-to toy for playtime? Shop more Skip Hop toys at Diapers.com. This post was created in partnership with Diapers.com. Occasionally, Away From The Blue blog may receive vendor or brand sponsorships for mentioning their products or services. The views and opinions expressed on this blog are purely my own. Images have been used with permission. Nap time is blogging time, and the evenings are blogging time as well. Great thing that my husband is very busy himself, otherwise he´d probably feel neglected. But yes, I did have to cut back, and whenever other things like the move come along, it gets almost impossible. You did so well still blogging through the move! I tend not to blog in the evenings much but maybe when baby is bigger and more predictable with his sleep patterns! I started my blog when the kid was 1.5 years old, and I remember how challenging it was to find time to blog! I can't even imagine how much more challenging it is with two! Great tips & I always love your posts! Wow that would be hard! I'm lucky I got into a bit of a routine of blogging first so it's been easier to keep up with babies. You have some good tips there! I don't have kids and still find it hard to balance blogging with everyday life so you have my admiration! Nap time is when I do all my blogging too, although sometimes it ends up being at night too! I love bath time too with my little one! She loves to play in the tub! Nap and night are when I typically blog. I'm always in awe of mums who manage to balance blogging with motherhood. Great of you to share some of your tips. Yes it's definitely best to spend time with them when you can, especially when they are younger. It's why I don't like to be on the computer when they need me. You know, I have to admit, I have wondered how you've managed to continue on blogging without really skipping a beat with TWO little ones! Man, you are supermom, haha! I love the tips you've shared here, though, because I intend on continuing with blogging after having babies, too, so it's great to refer to a post like this that give a heads up and some really great, helpful ideas! I love that you have Toddler T help with the laundry, that's so clever and truly a great way for them to get familiar with textures, I've never thought of this! Thanks so much for sharing, beauty, and I hope you're having a great week so far! haha glad I could shed some light on how I seem to manage it all. Great tips! I just had a baby boy 11 months ago and I just now feel like I'm getting my life organized again! Managing a newborn is no joke! I imagine it must be harding balancing motherhood with anything! I'm always impressed by working moms, I don't know how you can do it all! I'm not sure how it's going to work with two when I go back to work haha! Great post and thanks for the shout out! Miss L had only very short nap times as a bub and didn't allow much time for getting stuff done! Now she's older she can play next to me with toys I keep especially in the study for that purpose or can watch TV or iPad. Blogging is "me time" for me too. Though I don't have kids I can imagine the struggle to get a post ready and publish it then respond to comments afterwards. I have a day job that sometimes require me to be on-call 24/7 and as much as I love blogging it gets very difficult to get a post published. Oh on call would be very difficult! I find scheduling posts in advance so helpful! Oh, it is wonderful that you manage your blog although you have the two little boys who need indeed a lot of care and time. Your tips are really good and I think absolutely helpful for blogging mums. Great post and great tips! I think scheduling posts is really important and it's great that you manage to be so organised! Yes scheduling posts has been so helpful! Blogging is me time - great moto for blogging with babies I think. Yes they will grow up so quickly! It would be twice as hard with twins! These are great tips. I can only imagine how hard it must be juggling everything but you're doing a terrific job. 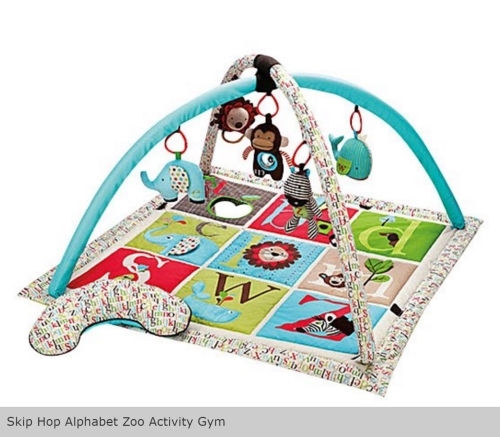 The activity gym looks perfect for keeping kids busy! hehe yes, kids have such short attention spans! As someone without a baby, this was a strangely interesting post haha! I think it's important to ask for help too, there's no shame in it. I'm glad you see your blogging as 'me time' too though as I find it really therapeutic. Sorry I haven't stopped by in a while, I've been hectically busy! Definitely! Blogging is fun but always comes second to kids. I admire you for managing it while you work too, not sure how it will go when I'm back at work! These are great tips and I am definitely taking note as I get closer to that stage! Kids are enegry vacuums so my kudos to everyone with kids who manages to blog! Still, as time and energy consuming as kids are, they're also a source of joy and happiness and I can't wait to be a mother some day. Lovely ideas for parents of toddlers! It is important to make most of time with children because they grow up so quickly. Awww good luck to you momma!!! Our baby gym saved my life when it came to getting ready in the mornings before work! I blog on my lunch hour at work. You know, when I'm supposed to be eating. lol It's true, as mamas we have a lot of rough times when it comes to managing our time, but the fact that we can do it, makes us superstars! I'm very impressed with your time management. I have no children and still manage to skip weeks by accident! I wish I could keep up a schedule but I can't :( Glad things are going well with baby T! It's okay, it's only blogging in the end and your work keeps you pretty busy! It's tough to blog with kiddos! They need attention and I want to give it to them but I also need my creative outlet! I try to blog on naptime and nighttime but there are times/days that I get on and need to get some things done! I let them play on the ipad or do a craft to keep them occupied if they're up and I need to be on the computer! These are super great ideas! Finding time to blog is always so difficult! I admire moms that blog! You ladies are super women! Mica, these examples are wonderful and will benefit many other mothers. They're really good. These are educational activities that will help both their minds & bodies to grow. You are an exemplary example of what a parent should be. I'm so proud and happy for you! Keep it up girl! Aww thank you Kim! :) Glad you think the post is helpful.